Our Soil Excavation Service utilises a controlled stream of compressed air to safely expose tree roots or or other delicate objects that may be damaged or destroyed if tackled mechanically. Our technology is designed to assist architects, urban planners, arboriculture consultants or anyone who may be carrying out works adjacent to existing trees. 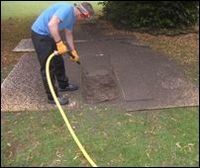 By delicately revealing the roots before any work is undertaken it is possible to compile a dossier of information regarding tree root spread and depth and also for revealing roots which may be growing around services such as sewer or water pipes. We are able to vary the force of the air flow depending on the demands of the project.